Saturn's moon Dione as seen by the Cassini mission in 2012. Scientists studying Saturn's moon Dione spotted weird stripes that they now believe could be caused by material falling onto the moon's surface. The new research is based on data gathered by NASA's Cassini mission, which ended last fall. In photographs taken by the spacecraft before it was destroyed, a pair of scientists saw long, narrow, bright stripes across the surface of Dione — which looked eerily like similar features already identified on another of Saturn's moons, Rhea. On Dione, they're weirdly parallel and look fairly young, and they're only found along the middle swath of the moon. "Their orientation, parallel to the equator, and linearity are unlike anything else we've seen in the solar system," co-author Alex Patthoff, a geologist at the Planetary Science Institute, a nonprofit research center, said in a statement released by the institution. 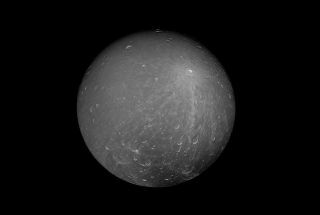 So he and his co-author tried to figure out whether they were caused by some sort of geological activity on Dione itself or by an external phenomenon acting on the little moon. To do so, they ran through a list of possible explanations for the features: Maybe boulders are rolling across the surface and leaving traces of their journey. Maybe the surface is split and the parts are rubbing against each other, like tectonic plates here on Earth. Maybe the streaks are shooting out from the sites of large impacts that shocked the moon. But the only explanation they tried that actually matched what they saw on Dione's surface was that material is slowly falling onto the moon from Saturn's rings, nearby moons or passing comets. Those explanations suggest that if scientists can get a better look at the features, they may be able to learn something about how plausible it might be to find life on Dione — or on worlds like it. The research is described in a paper published Oct. 15 in the journal Geophysical Research Letters.